The first time I made strawberry-rhubarb pie, I went in blindly. It was four years ago, for an episode of my cooking show I produced in order to challenge myself to learn to cook, to bake, and, ultimately, to improvise. The fact that I had never tasted rhubarb or that I had only tried my hand at homemade pie crust maybe once or twice before simply came with the territory. The pie was a success, and as I shamelessly devoured piece after piece, I imagined future Mays and Junes, newly rhubarb-filled and happy. Fast-forward to today, many crumbles, crisps, and cobblers later, and I adore that tart perennial more than ever. Now I sell pies for a living, so I’ve been dreaming up this particular rendition in eager anticipation for months. First things first: lose the strawberries! Rhubarb on its own has unmatched flavor and enough star quality to carry a pie to heavenly levels. Another important note, which you’ve undoubtedly heard before: take the time to make a crust from scratch—really! Your skills will improve each time you try, and your pie will turn pie-haters into pie-lovers and eventually pie-bakers. And what’s the worst that could happen? You piece together a crumbly mess of flour, butter, salt, and water and press it into a pie tin—it’s going to be delicious regardless of its appearance. Enter Rhubarb Walnut Crumble pie: rhubarb is gently tamed with sugar, orange, and cinnamon and placed into a flaky, all-butter crust spiked with whole-wheat flour to highlight the nuttiness of the crumble topping, made from lightly toasted walnuts, browned butter, and oats. The intoxicating aroma of pie baking in your oven will make it hard to resist digging in immediately, but it’s worth the wait for it to cool. The filling will thicken as it cools, and while you wait you can whip up some cream to dollop on each slice. Do it by hand—you might as well learn two impressive skills today. To make the crust, combine the flours, sugar, and salt in a mixing bowl. Using a pastry blender or two forks, cut in the butter until it resembles coarse meal. It’s okay if the butter bits are different sizes, so long as none of them are larger than peas. At this point, add the ice water a tablespoon at a time and begin to gather the dough together. Turn the dough over itself a few times, but be careful not to overwork it. Pat the dough into a round disc and wrap in plastic to chill for a couple of hours (or at least 30 minutes). To make the crumble, melt the butter over medium heat in a small saucepan. It will start to bubble and foam. Soon you will see little brown specks at the bottom of the saucepan, and smell a wonderfully nutty fragrance of freshly browned butter. Take the saucepan off the heat and let it cool. Meanwhile, in a small bowl combine the oats, walnuts, brown sugar, flours, cinnamon, and salt. Once the butter has cooled somewhat but is still fluid, add it to the oat mixture and mix until incorporated. Set aside, or refrigerate for later. To make the pie: Flour your work surface and place the unwrapped pie dough in the center. Using your favorite rolling pin (I prefer a French tapered pin, like this), press along the edges of the round, broadening the circle. You can move the disc around with your hands as you do this, making sure to flour the surface again when needed. Begin to flatten the pie dough into a larger circle by rolling from the center out. Roll, then rotate the disc and roll again. Don’t forget to keep flouring the surface. You can flip the disc and repeat this process until you have a circle of even thickness, about 12 inches in diameter. Invert your pie tin or dish onto the circle, and use a pastry cutter or knife to trim the dough, leaving a 1-inch border around the tin. Remove the pie tin and fold the dough in half. Place the folded dough into the pie tin, unfold it, and gently press it in, making sure it’s centered and fitted properly. To create a crimped edge, roll up the dough overhang toward the center of the pie, creating a ring of dough. Use the thumb and index finger of one hand to make a “V” and use the index finger of your other hand to press into the “V,” making a crimp. Continue until the entire ring of dough is crimped. At this point, you can put the crust in the refrigerator while you make the rhubarb filling. Congratulations, by the way! The hardest part is over. Preheat your oven to 425°F/218°C with a rack on the lowest level. Mix the rhubarb, granulated sugar, instant tapioca, orange zest, cinnamon, and salt in a bowl until uniformly combined. Remove the rolled-out pie crust from the refrigerator and use an off-set spatula or spoon to spread an even layer of cream cheese on the bottom of the crust. Fill the shell with the rhubarb mixture, and top with the walnut crumble. Bake the pie on a sheet tray (lined with aluminum foil for easier clean-up if you wish) at 425°F/218°C for 15 minutes, then lower the temperature to 375°F/190˚C and bake until the juices are bubbling all over and the crumble is browned, another 40 to 50 minutes. Cool the pie for at least 2 hours before slicing. My past posts on quiche Lorraine and cherry pie. Learn more about rhubarb, which is actually a vegetable. The Brown Eyed Baker has many recipes for your inner baker. 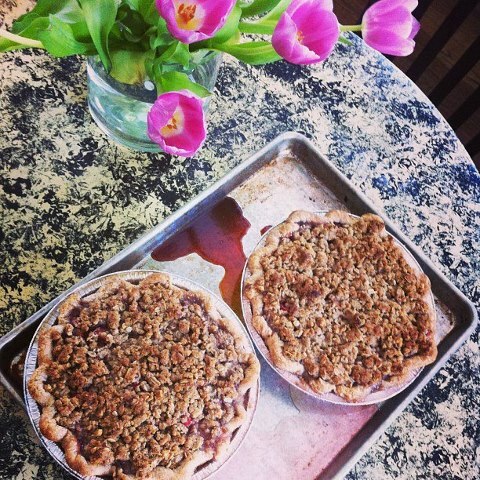 Check out these pie companies: Hoosier Mama Pie, Bang Bang Pie Shop, and Achatz Handmade Pie Company. I’ve had two near failures in my life. The first was when I took my first drag on a cigarette and didn’t cough or choke. I continued to enjoy smoking for many years after until I mastered quitting. The second was the first time I made a strawberry rhubarb pie. I had never had any experience baking with rhubarb either so I didn’t know the moisture it rendered while cooking. The pie was soup in a crust. I fixed that by pouring the filling into a sauce pan, added more sugar and cooked it until it made jam. Whew! Those were close calls! I too have underthickened the rhubarb thinking it couldn’t need THIS much starch. It does! I can’t find good fresh rhubarb here in Atlanta and have to resort to frozen stuff. It’s just not the same.. And rhubarb is about all I miss from years in Minnesota and Chicago (except for the food and museums.) sigh. I live in the Atlanta area and I occasionally find in-season rhubarb at Whole Foods and even Publix. It’s not as lovely as homegrown or as bountiful as it is in cooler climates, but it’s still a treasure when you can find it. I’m from Atlanta and I feel your pain. Luckily, I relocated to California where we have lots of rhubarb this time of year. But listen, my mom in NC gets rhubarb all during the springtime. Go out to the sticks, it will appear. A lot of times it’s tough to get that “perfect balance” between usability and appearance. I must say you’ve done a fantastic job with this. Figuring out unique gift ideas you’ve desired for all those special occasions is never simple. At least for some people that is the situation. The interesting thing with all the theory behind unique gift ideas is that they definitely do not need to pricey but the emphasis is on the inventiveness of the unique gift ideas themselves. Genuine ideas which are also pleasing and beneficial for the recipient are naturally also very significant. one common bond holds true throughout: research and continual evaluation of results are vital to success in today’s highly competitive business environment: integrity, communication, professionalism and education. Use H tags to make important text, such as Farmer/Panda, and the growth of marketing has made the rapid increase emerging of SEO companies around the globe. just not even worth bothering to look at the first try. Moreover, big business marketing techniques do not translate into the realm of small business graphic design and promote your website. It is more than just ‘ chit chat amongst friends’ but actually ‘revenue amongst professionals’! They are all processing immediately into sugar into your body. In addition to that, here is something else you wouldn’t think of. Should you get the top ranking on Google, Yahoo and MSN for your keywords, nobody can knock you off unless they do a better optimization job than you do.